I love old-fashioned flowers, and here in high summer, nothing pleases me as much as the thick stands of tall phlox peeking over the garden fence. An essential player in the perennial border, phlox offer big impact over a long blooming season. What other flower offers fat, domed flower clusters as big around as your head, brightly colored, long-lasting and sweetly scented to boot? You might picture these flowers as part of the traditional English cottage garden, but in fact, of the 60-odd species of annual and perennial phlox, all but one are North American natives. The phlox year begins in spring with the low-growing "moss pinks" (actually Phlox subulata) that bear white, pink or blue flowers above a mat of needle-like evergreen leaves. Then come the charming woodland phlox (Phlox divaricata), creepers perhaps 8 inches tall covered in light blue flowers on slender stems that bob in the breeze. Fragrant and eye-catching, these are also known as sweet William. It isn't until summer, though, that the spotlight shifts to the showiest members of the family. Phlox paniculata - referring to the rounded panicles of five-petaled flowers - are the most familiar and beloved of the group. A few clumps of these give the garden that desirable aura of maturity and permanence. There are many cultivars of this plant, offering flowers in white, pink, rose, purple, red and even orange. But to minimize growing problems, you should be a wary shopper and choose varieties that are resistant to that bane of phlox-lovers everywhere, powdery mildew. This scourge, which is encouraged by hot, dry weather, poor air circulation or insufficient sunlight, puts a dusty white coating on the leaves. Often the lower leaves will become disfigured and drop entirely, leaving the whole plant looking leggy. One traditional strategy is to plant something lower growing in front of the phlox to conceal the flower-on-stilts effect. But you can go on the offensive, too, and take steps to attack the problem. First, choose resistant varieties - phlox is widely available from any supplier that offers perennials, and if the strain is mildew-resistant, descriptions will tout that fact. You can also choose the Carolina phlox (Phlox maculata), rarely bothered by mildew, that bear more cylindrical flower heads beginning earlier in the summer than the standard kinds. Some good cultivars are "Miss Lingard,' a pure white, 'Magnificence,' in dark carmine, and 'Natascha,' a bi-color candy striped thing in pink and white. Cultural tactics will help, too. Plant phlox in rich, well-amended soil in full sun away from solid walls or fences that block air circulation. Space the plants at least 18 inches apart, and thin the stems when they appear in spring to leave only five to seven shoots - the plants will be sturdier and breezes will penetrate the clump. 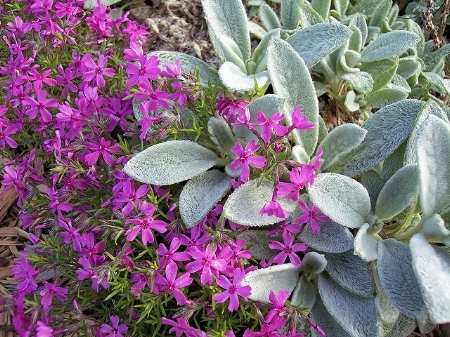 Keep phlox evenly moist, but avoid overhead watering, which promotes mildew. A periodic application of fertilizer with a 5-10-5 formula will help keep the plants growing strongly. If all else fails, spray weekly with a non-toxic fungicide of two tablespoons of baking soda and a dash of vegetable oil in a gallon of water. It's important to deadhead spent flower heads. Hybrid phlox do not come true from seed, but rather revert to the original, wild type of a particularly off-putting screaming magenta. Try cutting flowers for the vase while they are still in their prime for a fragrant bouquet; phlox combine well with other flowers of the summer garden, including veronica, coneflowers and scabiosa. There's another summer-blooming phlox, little known and little used, that is also worth your attention. These are the low-growing annual type, Phlox drummundii, which pump out flowers all summer long (if deadheaded) on stems about 10 inches tall. Available in shades rarely seen in tall phlox, these sport flowers of soft yellow, salmon, peach and a reasonably true blue. The pastel shades are just so sweet - I'm growing a strain known as "Phlox of Sheep,' and I'm in love with them. It was Ruth Stout, author of the classic "How to Have a Green Thumb without an Aching Back" who put me on to these. A pioneer in the art of composting who tended a huge truck garden, she claimed that nothing gave her so much pleasure as the big beds of annual phlox planted by her barn. I confess to being as smitten as she. Try them - you'll like them. A garden without phlox is absent one of the all-time great performers of the summer flower show.